Linz, Ennsdorf, Hanover, June 2018 – At this year’s Hanover Fair, Linz Center of Mechatronics GmbH (LCM) turned the Salvagnini plant in Ennsdorf into a kind of outdoor TV studio. From there, impressive pictures from the interior of the latest generation of automatic bending machines could be delivered directly to the large-area display and five conveyor monitors at the cooperation stand of Salvagnini Maschinenbau GmbH, sensor technology partner Pepperl + Fuchs and LCM. The astonished visitors were able to experience up close the digital advantage that Twin Space creates – the connection between real and virtual production worlds. The production process of workpieces that had been placed at the trade fair stand immediately before could be observed in images that had never been seen before. This is made possible by the Digital Twin from LCM, which virtualizes the design and production processes of machines and systems seamlessly. “Digital Advantage from Development to Production” was the motto of Salvagnini, Pepperl + Fuchs and LCM’s joint appearance at the trade fair. The aim of the company coalition was to show a concrete industrial application running in real operation, in contrast to the usual model-like small applications at trade fairs. “Our use case has shown that there are mature solutions especially for medium-sized companies with which they can benefit from this Digital Advantage,” explains LCM Managing Director Gerald Schatz. How Salvagnini’s new automatic sheet metal bending machine uses it was impressively demonstrated at the live presentation in Hanover. Visitors were able to choose the type and material of their desired give-aways on site. The order was then recorded using an RFID system and transferred via cloud to the production list of the machine at the Salvagnini plant in Ennsdorf. This allows large series without rejects and faultless production in batch size 1 even with different material batches. Shortly afterwards, the visitors were able to follow the production of their give-aways in batch size 1 live on a large display. And not only from the outside, but also inside the automatic sheet metal bending machine thanks to special cameras. “The cameras were positioned in such a way that it was possible to follow processes that are normally not visible to the viewer. 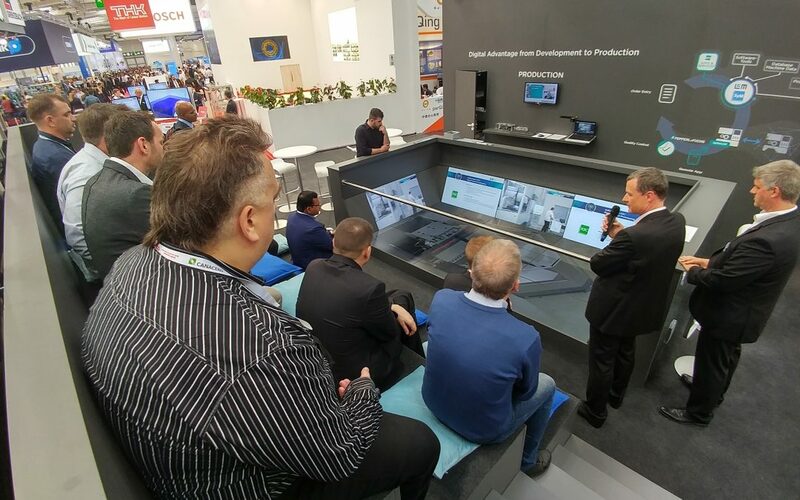 This view into the heart of the machine caused great amazement among the trade fair visitors,” says Manfred Reiter, LCM Head of Sales, about the numerous participants in the presentation. The digital twin developed by LCM automatically compensates for all relevant physical parameters such as ambient temperature, deformations in the workpiece and the machine. It also features MAC 2.0 (Material Attitude Correction) automatic material recognition, which controls the bending process in such a way that the same end product is always produced – regardless of the number of pieces, sheet thickness or material quality. At the same time, the digital twin is a first step towards a self-learning machine. The process knowledge gained is an indispensable basis for developing new machines. This also makes it possible to predict wear and tear and reduce maintenance and development costs. These developments are already simple and convenient with the LCM software platform SyMSpace – from modelling, calculation and simulation to virtual prototypes. Demand-oriented computing power from the cloud and flexible adaptation to existing software solutions make the “Digital Advantage from Development to Production” realisable and affordable even for small and medium-sized enterprises.